Lunch at Brick Lane on a Sunday is a torture, simply because you want to taste everything: it is the world's cuisine. Brick Lane food market is one of the most wonderful places in London. For £5 you can taste dishes from all over the world. 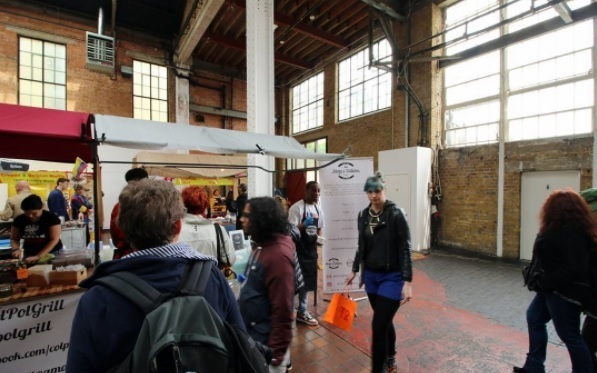 It is situated in the Truman Brewery, and you enter using a little door. Nothing could make you guess what awaits you. There are many stands in the market that offer menus and dishes from a whole bunch of countries, and you can test and taste before choosing. You can choose between Chinese, Indian, Ethiopian, Mexican, Cuban, French, Spanish, African, Moroccan, Japanese, Lebanese, Jamaican and many other dishes. Sometimes, the stands change but it is usually a great mix of international dishes. You could even go there for a treat in the middle of the afternoon, as some stands offer cakes and desserts, as well as fruits and juices. There are a lot of stands offering Asian products. I have tested several and the best in my opinion is the Wok Man. I especially love their sweet and sour chicken and their crispy chicken. For £6 you have the large serving: two meats and a side (fried noodles or Cantonese rice). I can tell you that with that you've eaten enough. Once you have your tray or plate in hand, you only need to find a place at a table outside. You can also eat your take away on the tables made available inside. For the less adventurous there are also a lot of Indian restaurants on the street and some more "continental" restaurants on the side of Old Spitalfields. So, every week you can taste a new dish by going to the food market of Brick Lane. There's no need to fight over the choice of a restaurant, everyone can choose his dish wherever he wants. Come early if you want to avoid the queue, or maybe even a bit later, if this Sunday was a sleep-in day. Brick Lane and the area all around there is great isn't it.